This dramatic picture is the second known image captured of a tornado. On 28th August 1884, as large storm systems converged, tornadoes ripped through Dakota, USA, causing around six deaths and property destruction. Photographer F N Robinson was able to capture two or three exposures of one of the tornadoes. As the tornado approached Howard City, it was visible over the horizon for quite some time, allowing Robinson to set up the cumbersome camera equipment with the help of an assistant. The angry clouds above the funnel were retouched. This was the 1800s and not many people had seen tornadoes, let alone capture pictures of them. Surprisingly, Robinson was not the only person to have photographed the tornado. Another photographer, J C Judkin captured a tintype image of the tornado, but it was lost by the people who were engraving it. Robinson made a souvenir card based on this photograph and copyrighted it, depositing a copy in the Library of Congress. 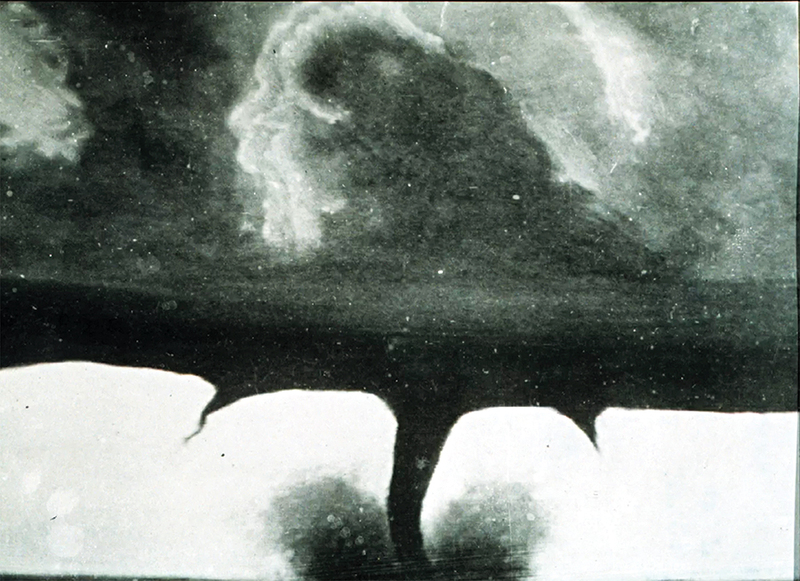 Because of its popularity, this picture is frequently, and incorrectly, credited as the first known photograph of a tornado. The souvenir cards too had this mistake in their captions. There is a tornado photo that was captured four months earlier by A A Adams in the state of Kansas. Adams had captured the tornado just as it was dissipating, is a lot less dramatic and not too well known.